You've probably seen the reviews of Daily Craft TV on blogs recently. 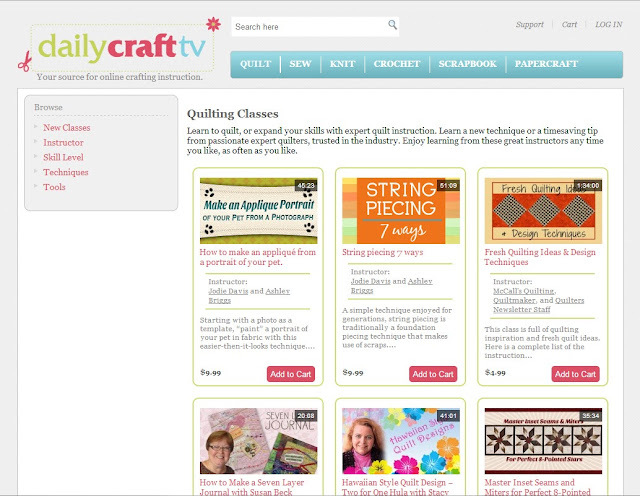 Daily Craft TV is a new site for classes in quilting, sewing, knitting, crocheting, scrapbooking and paper craft. The site is brought to us by Fons & Porter and associate companies like McCall's Quilting, Quiltmaker and many more. Daily Craft TV brings together many years of experience and crafting knowledge both through the companies associated with it and the instructors whose courses are offered. You'll find many of the big names associated with your craft on this site so it makes sense to sign up for their newsletter so you don't miss out on your favorite teachers. 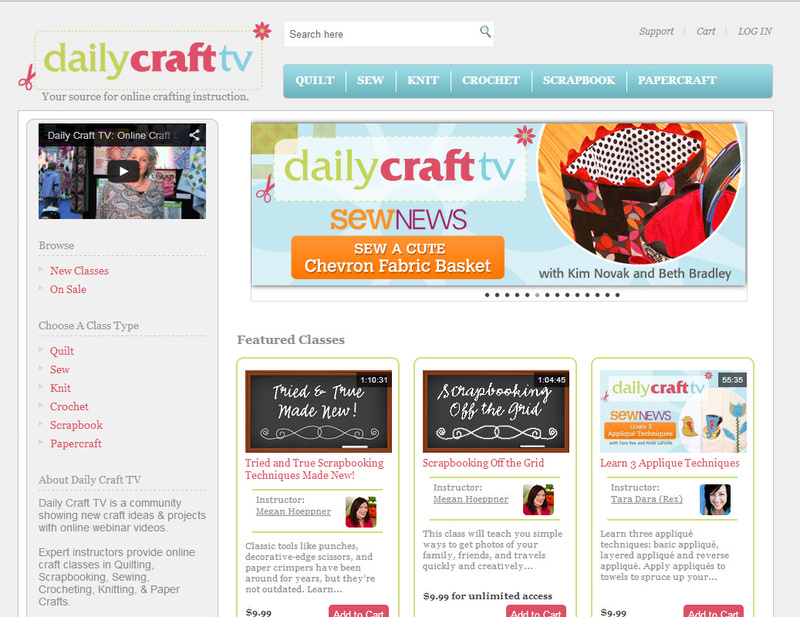 Daily Craft TV is very well designed and is easy to navigate. It couldn't be simpler to find what you're looking for. 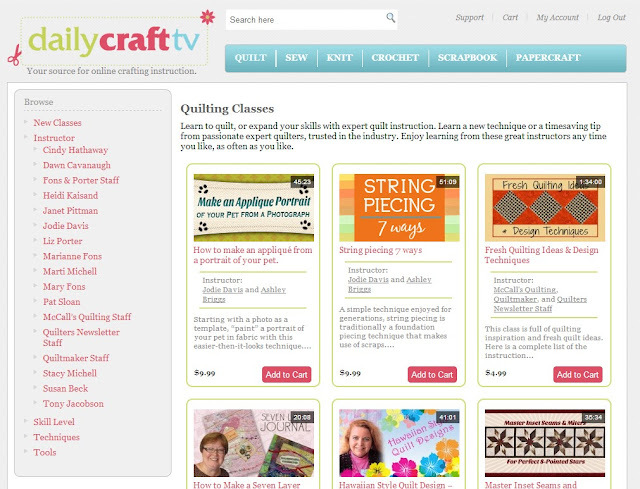 Just click on the craft you're interested in and browse. There are many quilting classes on offer and most for the great price of $9.99! Can you believe that price?!!! And they're full length classes too! Check out the instructors on this site! Learn from the best in the comfort of your own home! Taking a class is very simple. Create an account and purchase the class. You will then have unlimited access to it from your account. Yes You Can Piece Curves: Curved Piecing Two Ways by Jodie Davis. I have been intimidated by curves for a long time now and I have to say they make it look easy. I did want to make a practice block for this post but I think I'll wait to get a hold of templates for Drunkard's Path. I printed off the templates in the Class Materials but my printer did something funny and they turned out to be a little bigger than they should have been. So after cutting up some fabric I realized I was off. This may be something to check on if you are using the templates in the instructions. I enjoyed this class. Jodie Davis and Diane Tomlinson are engaging and friendly and clear with their instructions. They have a good rapport between the two of them so it feels like you're watching two friends and quilters work together on a project rather than being taught in a class. They make the process less intimidating, and simple even, with tips and tricks you can use when you sew curves. I was not sure if I could cut out the pieces like Jodie does. Cutting curves on a line with no template seemed something only the pros could do! But I tried it and if you're careful it's pretty simple. This class teaches you two techniques - curved piecing the traditional way and piecing curves with a paper piecing technique which Jodie Davis developed. This is an interesting technique and look for a quilt. If you like quilts with a little more dimension and texture this is something you should try. The class materials are clear and easy to follow. The pattern for Tres Chic - the traditional curved pieced quilt - is provided. I was a little surprised that there was no material for the paper piecing part of the class. It would have been nice if one pattern was provided for the curved paper piecing technique that was taught in the class. There's a nice little show and tell section at the end of the class and Jodie and Dianne show us some great quilts using both curved piecing techniques. All in all, it was a good class to take and I'm sure I'll come back to it when I get my templates! Many thanks to Eric Woolf for letting me review this class!